Houblonde is brewed with pure water that has been dynamized! In practical terms, this means that the water has been regenerated by passing it through a vortex. This vortex creates a whirlpool in the groundwater, giving it kinetic energy. The process is rounded off with magnetic fields and the transmission of natural mineral frequencies. Water dynamizers replicate the natural cycle of water in a concentrated manner. They impress spiral movements on the water that are similar to what happens in nature, giving the water the characteristics that it would have stored up during its natural flow. The result? 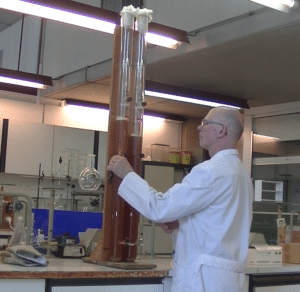 The brewing water of the Houblonde thus regains a quality comparable to that of a water that springs naturally from its source, a structured water filled with photonic energy! In addition, dynamized water transmits its taste and olfactory qualities to the beer! These qualities can be seen from the fineness and velvety softness of the beer’s taste, as well as its refreshing appearance that lingers in the mouth, its never-ending sparkling and its unctuously creamy froth. Working at the brewing science and technology laboratory at the Catholic University of Louvain (UCL) in Belgium, experts have conducted blind tasting tests to compare the effects of the dynamization of water on two beers brewed in an identical way. One using dynamized water, the other not. The result? 5 professional beer-tasters (brewing professors at UCL and master brewers) arrived at the same conclusion : « The dynamized beer seems to have greater clarity, is finer, gentler, lighter, more refreshing, more sparkling and has less of a bitter aftertaste than the non-dynamized beer ». HOUBLONDE concentrates the whole quintessence of the world of flowers. HOUBLONDE contains the floral elixir of a wild flower (Astrantia Major) ), which grows in the French mountains of the Pyrenees at an altitude of over 1400 metres. The elixir is obtained through the solar maceration of the whole flower. The elixir concentrates and transmits the energy signature of the flower to the HOUBLONDE beer. This elixir is obtained using nothing but flowers picked when they are mature, in surroundings protected from any pollution. The flowers are immersed in spring water taken from close to where they are prepared. This water is then energised and decanted into a glass container. The container is left out in the sun for three hours. The flowers are then carefully removed and the liquid is poured through a filter into a dark bottle, then energised again (through an ovoid-shaped vortex). This produces the “mother” elixir, which is then diluted in a base of organic cognac (40% proof, to help preserve it) and pure energised water. This creates the “daughter” elixir, which is added to the HOUBLONDE beer. The Astrantia elixir is certified to be of organic origin by the Ecocert certification body. The Astrantia flower whose elixir is found in HOUBLONDE beer is an umbelliferous plant that grows in damp soil bathed in sunlight. It draws the excess water from the soil so that the moisture evaporates in the bright air, which in turn aerates the saturated ground. It is in producing this metamorphosis that Astrantia Major reveals all of its energy alchemy. This is what explains all of its psycho-existential virtues. In fact, Astrantia enables us to breathe and freeing us from tensions and densities so that we can regain a sense of lightness and inner peace. 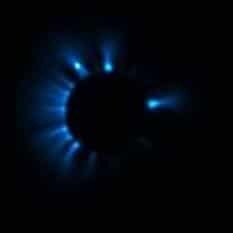 It illuminates dark areas and takes light into the very heart of our cells. All floral elixirs act as catalysts for our emotions and help move our awareness towards greater authenticity and personal fulfilment. The Astrantia elixir found in HOUBLONDE beer triggers and guides these transformations and transmutations. HOUBLONDE also contains vanilla obtained by infusing fresh vanilla pods. Its gentle, subtle flavours blend admirably well with the grains of barley, wheat and hops, giving HOUBLONDE beer its velvety, soft and subtle taste. 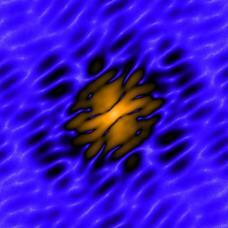 For the first time in the world electrophotonic energy has been measured in a beer, Houblonde! The results are glaring, just look at the pictures! See how Houblonde beer contains electrophotonic energy compared to common beer, see the difference in light radiation and the harmony of its structure! The hexagonal logo of HOUBLONDE reflects its soul! The Hexagon in its three-dimensional version represents a cuboctahedron , which is an Archimedean solid. The cuboctahedron is made up of 8 triangles (3D tetrahedrons), 6 squares (3D cubes) and 12 identical vertices. It is the only geometric shape in which all of the vectors are the same length, both those that link the vertices and those that go from the centre to the vertices. All of the vectors are also at an angle of 60° to each other. 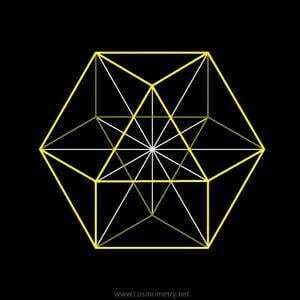 This gives the cuboctahedron perfect symmetry, which is why it is called a vector equilibrium (VE). It is also considered by those in the know to be the foundation of all structural geometry in the cosmos. 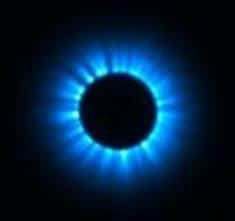 From an energy point of view, the VE represents a wave of perfect shape that generates a movement of energy that ends in a state of absolute equilibrium (the zero point or absolute vacuum). Each vector in the HOUBLONDE logo measures 1,618 cm, which is the PHI golden ratio number. The Hexagon also corresponds to the structure of the living water which is the one found in the dynamized water present in the Houblonde beer. 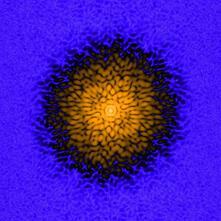 This is a 6-point molecular structure as illustrated in the photos of dynamized water crystals! 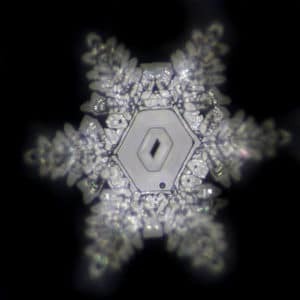 Photograph of dynamized water crystals = 6-pointed crystal which when joined up represents a hexagon; the core of the crystal is also a hexagon! 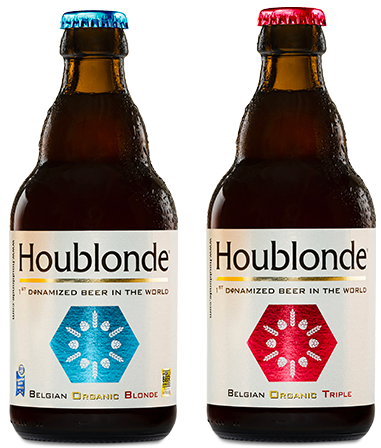 The HOUBLONDE logo represents this hexagon that features a structure with 6 points made up of ears of cereals (barley and wheat) and hop flowers by way of reference to the beer! The blue colour of the logo refers to water. The shiny appearance of the “aluminium” foil label represents light and the photonic energy present in the dynamized water.